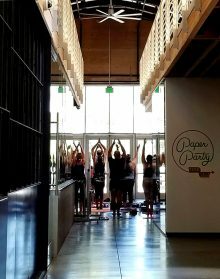 Join Rooted Community Yoga Project in the Jacobson Gallery every 2nd and 4th Saturday through October 14 from 9:30 to 10:30 a.m. for guided yoga practice surrounded by Steven Yazzie’s installation, Black White Blue Yellow (BWBY). All levels welcome. Yogis who bring their own mat for the class receive 2-for-1 general admission to the museum. Museum members attend for free. Please see all dates and times to the right. Class is limited so register now to save your place! Class included with museum admission. Members attend free.